Welcome to Leicester v Gladbach minute by minute report from the King Power Stadium in Leicester. 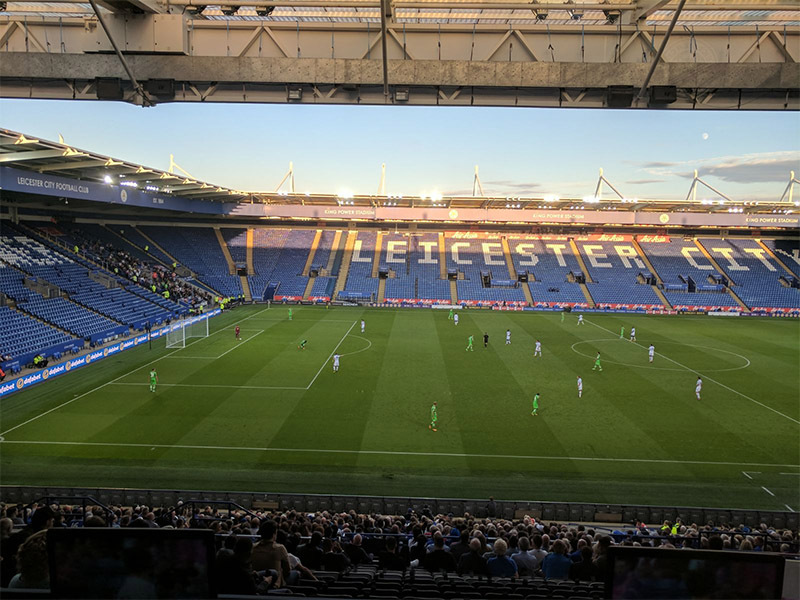 The Futbolgrad Network is on location in what promises to be a highly entertaining friendly between Leicester City and Borussia Mönchengladbach (more commonly known as ‘a German team’). A tale of two halves for the Bundesliga side, we saw enough though in the first 45 minutes to be able to say Hecking’s side should be a team to watch over the next nine months. We’re into the final minute here at the King Power — There’ll be 4 minutes of additional time.! Do the Officials know it’s a friendly and not the Champions League? A Gladbach equaliser doesn’t look to be coming. Die Folhen will be happy to get back to Borussia-Park with no more injuries, the Bundesliga side looked strong for large parts of this fixture — Reece Oxford will be a good addition to a technically sound squad, a shame we couldn’t see him in action this evening. Iheanacho bangs the ground in frustration, he looks hurt, he’s taken his boot off and he’s limped off. Not good news for Leicester. Borussia Mönchengladbach have found their way over the half way line again! Stindl and Strobl going off just took the balance off their play – They didn’t stay in Leicester’s half for long though. Gladbach carved open — New boy Iheanacho lays it on a plate for Vardy to grad his second of the game. If Gladbach had the lion’s share of the first 45, the tables have turned now — Gladbach look wobbly all of a sudden. Gladbach can’t ride the full storm — Vardy from close range makes it 1:1 — It’s been coming for 10 minutes, what is Gladbach’s answer? What a save again by Sommer — Shinji Okazaki brings a wonderful stop from the Gladbach GK, that looked in. Leicester look for the ball around the back to Vardy again — It is what gave the Foxes a Premier League title the other season, Gladbach need to be wise to that particular threat. Leicester with another good opportunity — Okazaki puts Vardy clear, one on one, but Sommer remains big and stops what looked to be a certain goal. Leicester have their first real sight at goal, Sommer is equal to it and pushes the ball wide for a corner. The resulting corner is cleared easily – Die Folhen ride the storm. Vardy with a late challenge on Vestergaard – The Leicester crowd think he’s over reacting — He’s not, that’s twice Vardy has been late. The stretcher is on, it doesn’t look like good news for Strobl he looks in immense pain — Hoffman comes on. It looks a serious one for Tobias Strobl. TOOOOOOOORRRRRRRRRRRRRRRRRR: Gladbach — Hazard with a beautifully curled shot from the edge of the area. Schmeichel had no chance. Gladbach started very strongly, Leicester came into the game towards the end of the half. Hecking will be pleased overall with what he’s seen so far. Die Folhen’s movement has been excellent, the travelling fans in the corner will be buoyed by what they’ve seen so far. Ginter with a rush of blood to the head leaves space in behind for Ndidi to unleash a shot at Sommer, the GK saves and Vardy can only put the follow up over the bar. Traoré is full of energy on die Folhen right side, he looks exceptionally sharp — Linking well with Zakaria in the middle. Zakaria with a bullet, Schmeichel at full stretch tips it behind. Gladbach still on top but can’t find a way through. Vardy catches Wendt across the back of the head, no freekick but the game is stopped for a second. Naughty from the England international. Christian Fuchs shoots from distance, Sommer is beaten but the ball drifts to the side of the Gladbach right-hand upright. Okazaki goes close for Leicester — Just over the bar.. a recurring theme so far for both sides. Jamie Vardy is flagged offside, replays show it isn’t, he was clean through one on one……..! Gladbach’s training rondos are showing. The quick interplay and movement off the ball has been exquisite in the opening 15 mins. Stindl ended a great piece if play by firing his shot just over. Sommer flaps at a Leicester corner, Wes Morgan is free but the Foxes captain can’t find the net. Raffael again, skilfully opens up space on the edge of the box but the shot is deflected over the bar. Die Folhen look the stronger side so far. Raffael fires a shot to the left of the Leicester post from 18 yards, Schmeichel was scrambling. Leicester (4-4-2) Schmeichel, Simpson, Morgan (c), Maguire, Fox; Albrighton, James, Ndidi, Gray; Vardy, Okazaki. Gladbach (4-4-2) Summer; Elvedi, Ginter, Vestergaard, Wendt; Zakaria, Kramer; Traoré, Hazard; Stindl (c), Raffael. Starting Lineups..! A strong Leicester, including Vardy, Fuchs, Morgan (C), and GK Kasper Schmeichel. For Gladback — Lars Stindl (C), Sommer, Raffael and Matthias Ginter all start. Hello and good evening from the King Power Stadium in Leicester where tonight we will see just how prepared Dieter Hecking’s Glabach are for the new Bundesliga season.